The 2018 Honda Accord Touring. 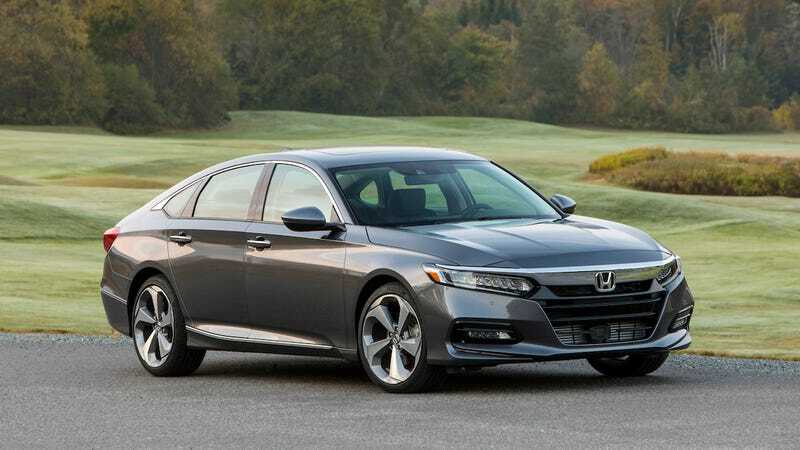 Honda will stop production of the Accord for about two weeks this summer to “focus on aligning production to current market conditions,” a spokesperson told the Wall Street Journal. The current market conditions are that no one wants sedans anymore, not even the really, really good ones. We’re all monsters. Yes, all of us. We’re all monsters because even we car lovers, we who don’t want this crossover craze to be the death of cars as we know them, are approached by friends and loved ones with the question of, “What vehicle should I buy? I want something spacious, I like riding higher off the ground and I want cargo space in the back.” To our sadness, we realize that the only logical recommendation is a crossover, and we recommend one because it’s what’s best for that person. Wait, what were we talking about before the daily crossover soapbox got rolling? Oh, right. Halting production of the Accord, the every sedan that comes with a Civic Type R engine—or similar to it—and an option for a manual transmission. We are, again, all monsters. Anyway, Honda will halt Accord production at its Ohio plant for 11 days between now and the end of July because its sales pace is not great. The Journal reports that Accord inventory on lots in February was over 100 days’ supply, which is far higher than even the average dealership numbers during a continuing sales slump late last year—CNBC reported in September that vehicles were sitting on lots for 74 days on average, an industry high since it was 80 days in 2009. The Journal reports that the 4,200 employees at the plant can take unpaid days, vacation days, or to come into work to do other stuff during those 11 days. Summer shutdowns are common when sales aren’t booming, especially for U.S. automakers. But the Journal reports that the slow choking of the sedan market hasn’t hit non-U.S. automakers like Honda as hard. Unlike Detroit auto makers that have either eliminated entire sedan lines or slowed down sedan production over the past year, Japanese, German and Korean auto makers haven’t taken their foot off the pedal. Honda’s big bet on sedans comes at a time when consumer preference is rapidly shifting to trucks and SUVs amid low gasoline prices. The Accord launched around the same time as its biggest rival, Toyota’s Camry family sedan, was also redesigned. The Journal reports that year-to-date sales of the Accord through February are down 12.9 percent to 37,430 cars, while Toyota’s Camry sales had a 2.3-percent increase during that time to 48,929 vehicles. You know what the Camry doesn’t come with in America? A close relative to the Civic Type R engine, or a manual transmission. Most of those beloved crossovers don’t, either, yet people are all over them. Let’s all start hiding from ourselves at night, because we’re the monsters under our own beds.